Homestead resident Sean LaFaver captured this image of a mountain lion in his yard Tuesday night. EDWARDS — Tuesday night, Sean LaFaver was loading up his car in anticipation of a Wednesday morning trip to Denver when he heard an unusual screeching noise. He walked around the corner of his Homestead house to investigate and got a big surprise. About 10 feet away, sitting in a tree, was a mountain lion. “But I didn’t want to hang out outside for too long,” he said. LaFaver didn’t want to put himself in a dangerous situation, so he went back into his home and turned on his outdoor lights. He then captured photos of the animal, which was accompanied by a pair of cubs and dragging a dead deer. A decade ago, LaFaver’s experience would have been very rare. But according to Colorado Parks and Wildlife District Wildlife Manager Craig Wescoatt, local mountain lion sightings have definitely increased. 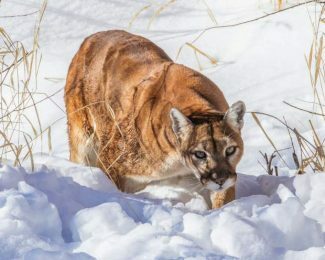 Mountain lion sightings are up in Eagle County, but wildlife officials are unsure if the cause is an increase in the population or the result of more human presence in backcountry areas. Like other carnivores in the wild, mountain lions are always on the lookout for an easy meal. “Lions are definitely carrion eaters,” said Wescoatt. That means a lion will pounce in for a quick meal when they spot roadkill, said Wescoatt. In addition to deer, lions prey on smaller mammals. Such easy eating brings lions closer to humans. “I don’t think this is an issue with human safety, even with the numbers we are seeing,” said Wescoatt. But, he added, it is always important to be aware that we share our environment with these predators. Wescoatt’s first piece of advice is to always be aware of your surroundings. If you encounter a mountain lion, make yourself look as large as possible, don’t turn your back on the animal and don’t run away. “If the animal attacks, fight back with everything you have,” said Wescoatt. That’s how a Front Range man survived a mountain lion attack earlier this month.